Fine powders are frequently far from optimal from the perspective of processing performance or indeed product usage. Often associated with health and safety concerns such as dust explosions, air/water pollution and poor workplace hygiene, they can also compromise manufacturing efficiency by exhibiting sub-optimal flow behavior. Granulation is one of a range of agglomeration or particle enlargement processes routinely applied to transform fine powders into coarser, uniform particles with properties that make them more desirable, and valuable, as both intermediates and products. Learning how to effectively control granulation processes is critical to their efficient deployment but is often complicated by the difficulty of identifying granule properties that can be robustly measured to determine product quality. This is particularly true when the granules produced are an intermediate, rather than the finished product, as is often the case. Dynamic powder testing offers precise and relevant bulk powder characterization and has been shown to have considerable value for robust identification of an optimal endpoint for wet granulation processes. The introduction of new in-line technology, that similarly measures bulk powder flow properties, is therefore of considerable interest for the real-time monitoring of these crucial processes. In this article, we consider the application of granulation processes and strategies for characterization of the resulting product, focusing on the benefits of dynamic powder testing and new in-line technology that characterize bulk powder flow. Case study data illustrate application of the in-line technology for the real-time monitoring of a high shear wet granulation process (HSWG). Close agreement between the in-line data and dynamic test results underlines the potential of the new technology to accelerate and improve process development, scale-up and control. These attractions are exploited to, for example, produce fertilizers with a controlled breakdown/release profile that are easily spread and similarly in the food and detergent industries to manufacture stable products that are easy to use and deliver well-defined performance. The pharmaceutical industry is a particularly prolific user of granulation technology principally to prepare optimized blends for compression tableting. Active pharmaceutical ingredients (APIs) are often very fine, crystalline materials that flow poorly and can be difficult to maintain in a consistently dispersed state, in a blend of what are generally coarser excipients. Granulation delivers a feed that can be processed through the tablet press at a high throughput to deliver a finished product that meets the necessarily stringent quality standards; HSWG is typically the technology of choice. The popularity of HSWG can be attributed to its speed, efficiency, and suitability for a wide range of different materials. In addition, HSWG produces dense granules with low friability that are well suited to pharmaceutical requirements. It is essentially a two-step process involving dry blending of the ingredients followed by wet massing/granulation that is triggered by the addition of a binder solution, typically water. See Figure 1: The high-shear conditions required for HSWG are produced by the combined action of an impeller and chopper. In-line analyzers are most easily installed through a port on the top of the granulator. Steering HSWG to a desirable endpoint, the point at which the granules have attained optimal properties for their intended application, relies on being able to measure a property that characterizes them in a relevant way. One approach is to measure granule size but this is often less than ideal. If we consider the example of applying HSWG within the context of a tableting process, then the aim is to produce granules that are free-flowing and will compress well. Particle size is just one of many properties that influence these behaviors. Powder flowability, for instance, is also known to be a function of particle shape, density, surface texture, porosity, and hardness/friability, which means that changes in powder flowability cannot be reliably captured by measuring particle size data alone. This limitation is particularly problematic when granules are an intermediate. In the case of tableting, if the parameters measured during or immediately post-granulation do not correlate with finished tablet quality then the granules must be processed through the tablet press to assess their quality. This is essentially a lengthy, iterative approach to granule characterization that compromises process development, scale-up and control. Scale-up is particularly challenging for HSWG because differences in equipment geometry and/or process dynamics complicate the transfer of optimized processing conditions. Identifying a relevant variable that can be measured to directly assess granule quality streamlines development and optimization activities. 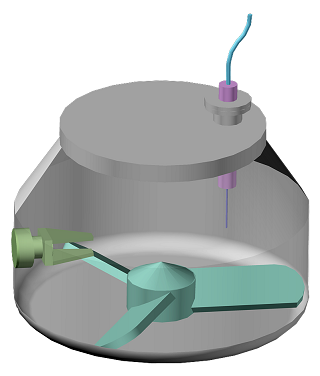 Dynamic powder testing using a powder rheometer directly quantifies powder flowability by measuring the axial and rotational forces acting on a blade as it rotates through a powder sample . Basic Flowability Energy (BFE), a measure of confined flow properties in a low stress state, is a key baseline metric but testing can be applied to dry or moist granules in a consolidated, moderate stress, aerated or even fluidized state to generate a range of different flow parameters, depending on process requirements. In addition, powder rheometers are able to measure properties such as compressibility, permeability, and shear strength to provide a complete assessment of granule behavior. Studies investigating the value of dynamic testing in the preparation of optimized tableting blends by HSWG show a direct correlation between the BFE of granules (wet and dried) and the hardness of tablets manufactured from them . This highlights the value of bulk powder measurements for granulation monitoring and control. Dynamic powder testing is an at-line technique but in-line technology that similarly measures bulk powder properties has recently been commercialized bringing new options for the continuous monitoring of granulation, blending and material transport processes. See Figure 2: A drag force flow sensor provides high resolution, high frequency bulk powder characterization. 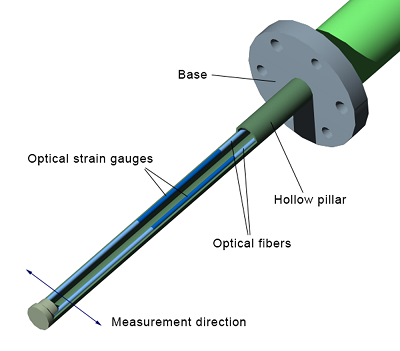 A drag force flow (DFF) sensor is a thin, hollow cylinder, just 1 to 4 mm in diameter that can be mounted directly inside processing equipment to provide real-time measurement of the flow forces within in-process material. Flow disruption is minimal because of size of the sensor. Material flow causes a deflection of the pin, the magnitude of which is detected by optical strain gauges on the inner surface of the sensor (see fig 2). These measurements of deflection are reported in the form of Force Pulse Magnitude (FPM) data which directly correlate with fundamental parameters of the material such as density and shear viscosity. Complementary temperature measurements enable the automatic correction of temperature-related drift in the measurement baseline. This technology tracks changes - either intentional or otherwise – in a bulk powder mass, in real-time with no requirement for sampling and minimal manual input. Measurements are relatively unaffected by material on the sensor surface so operation remains reliable in fouling conditions, an important feature for in-line granulation monitoring. Furthermore, the probe has no moving parts, easing maintenance and boosting reliability. FPM is a differential measurement which eliminates the potential for baseline drift, and measurement frequency is sufficiently high – up to 500 samples per second - to provide a high-resolution, real-time data stream. The following case study shows the use of DFF sensor to monitor a HSWG demonstrating its potential for granulation monitoring. Batches of three placebo pharmaceutical formulations containing different levels of binder (hydroxypropyl cellulose –HPC) were produced in a 10 L high-shear wet granulator to assess the ability of DFF sensor to track the granulation process. Reference 3 provides full experimental details of the trial. See Table 1: Composition details for three placebo pharmaceutical formulations, containing different levels of binder - hydroxypropyl cellulose (HPC). Two kilogram batches of dry powder were made up according to the compositions shown in table 1 and then granulated with 800 g of water. Granulation consisted of three minutes of dry mixing followed by three minutes of water addition and up to five minutes of wet massing/granulation. The impeller and chopper of the granulator were kept on throughout, from dry mixing onwards, with impeller tip speed maintained at 4.8 m/s and chopper speed set at 1000 rpm. These conditions were set on the basis of previous optimization studies . Figure 3 shows smoothed FPM data (rolling average over 300 blade passes/20 seconds) measured using a DFF sensor (Lenterra Flow Sensor (LFS) system; measurement range +/- 3N; Lenterra Inc.) during the granulation of the 5% HPC formulation. Seven profiles were generated because the granulation was stopped at predetermined times to permit sampling and at-line measurement with a powder rheometer (FT4 Powder Rheometer, Freeman Technology) . Once a granulation had been stopped a new granulation was started with the same formulation to produce samples for later time points. The seven traces correspond to the dry powder blend (profile A, Figure 3), and granulations stopped 1, 2, 4, 6, and 8 min (profiles B to G, fig 3) after the start of water addition. 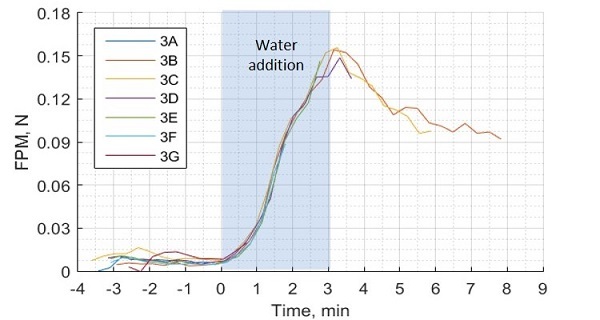 See Figure 3: In-line FPM data for granulation of the 5%HPC formulation clearly shows the change in consistency of the granulating mass as water is added and the granulation proceeds. Note: negative times on the x axis are associated with the dry mixing period prior to water addition. Superimposition of the data for each batch confirms the high reproducibility of the in-line sensor. Water addition triggers an increase in FPM which peaks soon after the completion of this step. The FPM peak can be associated with the endpoint of the granulation, which typically occurs soon after water addition. In-line and at-line data for all three formulations are summarized in figure 4 and show closely similar trends. Clear differences are observed in the behavior of the three different formulations with the results indicating that higher binder contents are associated with the production of stronger granules. 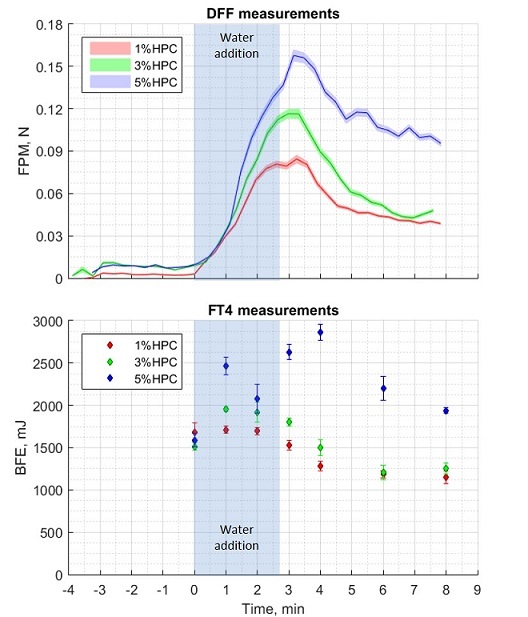 See Figure 4: Close agreement is observed between FPM measurements from an in-line DFF sensor and BFE data measured using an at-line powder rheometer. The close agreement between FPM and BFE data indicates that like dynamic testing the DFF is able to provide process relevant measurement for a HSWG being used to prepare tableting blends. This suggests that the two techniques are highly complementary for the efficient development and control of wet granulation processes. The introduction of new in-line technology for the characterization of bulk powder flow offers significant opportunities for enhanced process monitoring. By delivering a high-resolution, continuous data stream, this instrumentation enables the effective tracking of industrially important processes such as HSWG. Close agreement between DFF sensor and dynamic powder testing measurements highlights the process relevance of the new technology and its potential to deliver real-time data that can accelerate and enhance process development and control. Tim Freeman is managing director, Freeman Technology. For more information, visit www.freemantech.co.uk.